Just a bride and her maids. Michael and I were lucky enough to spend this past weekend celebrating the marriage of two of our very best friends. Emily and Bradley finally tied the knot on Saturday and their big day was SO perfect! I couldn't be more honored to have been a part of it. I met Emily in college. We joined the same sorority and while we didn't become BFFs right away, our friendship really blossomed once we moved off campus and lived together with several of our girlfriends. We quickly became inseparable and had the best time living up that single, college life. We shared a name, a couple houses, friends, clothes, drunken stories, laughs, tears, and so many great memories. Seems crazy to think that here we are so many years later getting to marry two awesome guys who happen to also be best friends! I took the day off work Friday to help decorate the hall for their special day. I wish I would have taken some pictures of the decor because I loved how everything turned out. It was rustic, simple, and beautiful. Friday night, we headed to the rehearsal at Cuivre River Park and then had dinner catered at the KC hall in Millwood. My girlfriend, Kara, who was also a bridesmaid, spent the night with us so that she didn't have to drive all the way back to St. Louis. We enjoyed a great dinner, great company, and a few drinks before heading home to rest up for a full day of fun. Soon to be Mr. & Mrs.
Saturday we woke up bright and early to shower and then go get our hair and makeup done. As luck would have it, there was a slight hiccup in our morning plans as the power at our house went out. Luckily we live close to Michael's parents and they were kind enough to let us use their shower. We spent the morning hanging out getting our hair and makeup done. The bride looked SO beautiful. One of our friends commented that she looked like a barbie doll bride, and I could not agree more! 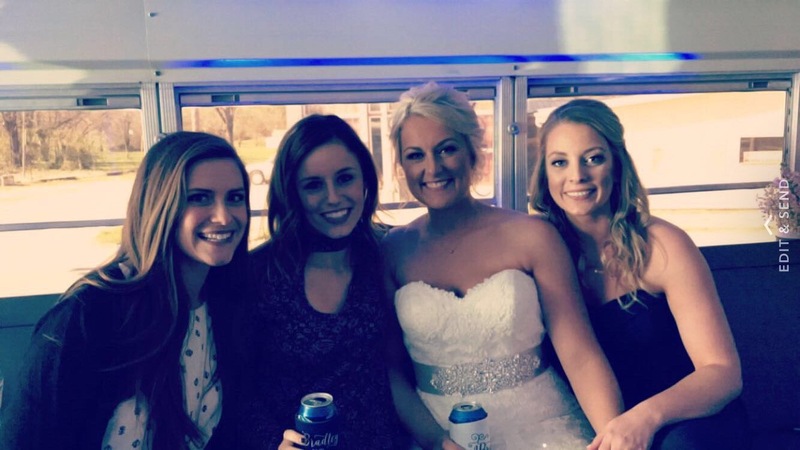 After hair and makeup, we hopped on the party bus and headed to the hall to pick up the guys. The sweetest flower girl in all the land. Starting off with a shot of fireball. Party bus pics. Love this girl! Thankful all of our guys are friends! Emily and Bradley took their first look pictures and then we were off to the park to take some group pictures. The ceremony was outside under a large gazebo. Everything was so gorgeous. The weather was perfect. Considering it rained literally every day last week except Saturday for their wedding, I'd say they really lucked out! A couple of my favorite gals. "Please just take one more picture with me!" - "We've already taken hundreds!" After the ceremony, we popped into the local bar before heading back to the hall for a night full of laughs, photo boothing, and a lot of dancing! I can only hope that our wedding is half as fun as theirs was! Cheers to you, Mr. & Mrs. Mudd!! Such a great post, Em! Friend weddings are the best. Michael better brace himself for all the pics he will be taking on his own big day. They really are! So much fun!